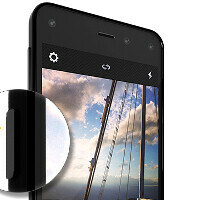 Are you getting the Amazon Fire Phone? Amazon is reshaping the notion of what a typical smartphone could be with the just-announced Fire Phone. As this happens to be its first smartphone, it had to make a noticeable entrance, and we have to say it did indeed. Besides the stellar specs, such as a bright, 590-nits IPS-LCD display, peppy Snapdragon 800, 2 GB of RAM, 13 MP OIS camera, and a dual stereo speaker system, we are getting unique features that you can't see on any other phone right now. We are talking about the 3D-like Dynamic Perspective sensor system, where the invisible infrared illumination of four frontal cameras is combined with the gyroscope, accelerometer, magnetometer, barometer, proximity sensor, and ambient light sensor. This allows the Fire phone to follow the location of your eyes and head numerous times per second, and adjusts the interface accordingly, giving perspective to the typical flat 2D images you see on a regular handset. These can also be used for touchless interface navigation, scrolling, or even gaming, too. Amazon has also thrown in all the music, movies, TV series and reading apps you can think about, tying it up in an ecosystem of its own. Moreover, there's a new service called Firefly, which can recognize over a 100 million objects - from songs, through dishwasher soaps, to phone numbers on a poster, and find them at the lowest price, or throw more info about them at you. The laundry list of new features is plenty, so the Fire Phone is shaping up to be one of the most interesting handsets for the year, and out of the blue at that. This is why we wanted to ask you whether you are intrigued enough to get it for two Benjamins when it lands on AT&T July 25th. Check your preference, and throw an argument or two in the comments. Thanks, but no thanks......I'll stay with my Lumia 920. The tech in the Amazon fire phone is actually pretty cool. Considering no one has 5 front facing cameras on any phone. Only Amazon right now is the first. It has an excellent CPU, ram, and storage amounts. The other thing is it comes with amazon prime instant videos and music which means you get a year of both services for free. 20 million songs, plus amazon instant video. For a number of the music services alone it costs around $100 a year. It also costs $100 a year for amazon prime service. So basically you are getting unlimited music and videos for a year. That alone is worth $199 for the Amazon fire phone. If I lived in the states I would most likely get this phone. Still not interested in Amazon's new toy. Once Jeff sees the low adoption rate metrics, maybe he will understand the risk of doing carrier exclusives. I rather have one good front facing camera than 5. To me that's a gimmick, not a selling point. It's still priced too high and too limited release for a phone that's in no way groundbreaking. I dont like buy a phone for one feature I keep my 820 with searching musics and tags and cortana! Had 920 and screen irresponsive in a month. Googling for a solution and found that issue reported by umpteen users without solution. By the way I hated those large bezels, heavy weight and worst windows UI. I hope Nokia/Microsoft will improve their screens next time. +1 I'll stay with my 1020 for now but good to see they using Here Maps. Maybe, but I could say the same about the quality of the piñatas that come from Brazil. They fall apart before you hang them. I'm unimpressed. Amazon gets a yellow ribbon for participation. Will it have Google maps. If no. What GPS comes pre-installed. GPS maps is Google maps. Nokia Here is not on Amazon. Google maps is better anyway. Actually, Nokia maps are very good. If you ever used a Nokia phone, especially Lumia, you know that you have a pretty good navigator in your pocket, whenever you need it. so..... amazon fire tablet utilizes a choppe up version of android so they aren't required to include the google play store..... although the specs are sadly pretty much exactly what i want, i'm looking for a more... 'vanilla' google experience plz'n'ty. Yeah, I like the hardware, and the features sound nice but I'd honestly be more likely to jump from Google Android to iOS than I would be Google Android to Amazon Android. Amazon just isn't offering much incentive for me to move to their ecosystem. I voted YES! , tho I would have to see it person.. Overpriced = no. No Google Play = No. AT&T Exclusivity = NO! The AT&T Exclusivity is was really irks me. This isn't 2009. You got a good phone to sell, sell it to everyone! As much as Amazon wants to think they're as cool as Apple with that deal, they aren't and this phone isn't the iPhone. No, the AT&T exclusivity kills it; I have T-mobile and have no plans to change carrier. You can always have it unlocked for T-Mobile. I'll see, I plan to wait until November to upgrade my Nexus 4. I'm interested in the iPhone 6 or that Mclaren Lumia windows phone. The new tech is great. Dont get me wrong. Glad to see somebody is doing something different and pushing the limits on a smartphone. On the other hand; here are the issues. 1. 720P screen, yuck. 2. AT&T only, biggest fail of the year. and 3. 299.99 on contract, yeah; maybe if I was buying it outright at cost.